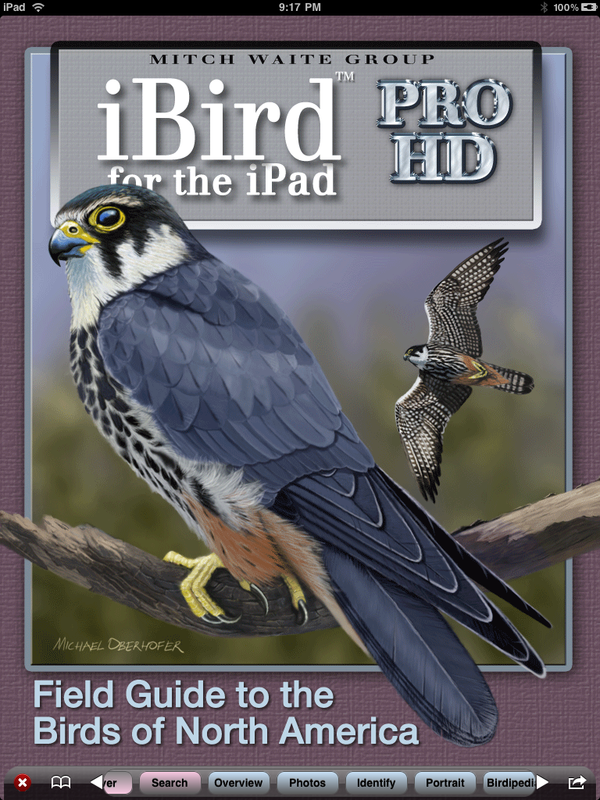 Birders -- looking for an excuse to buy an iPad? The wait is over. The stunning and complete iBird Pro HD for Apple’s iPad is a fantastic app! As I pen another guest post for the IBB, I first want to catch our readers up a bit. Like rabbits (or maybe we should say starlings), good ideas seem to multiply with each collaboration that Robert Mortensen and I undertake. 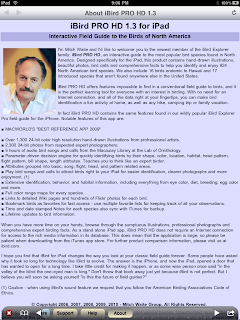 From last Spring’s birder profile I was flattered to complete, came Robert’s request for a guest post review of the BirdsEye iPhone app. 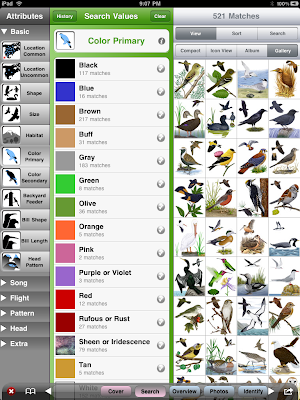 From that came the idea to take a broader look at other birding-related apps for iPhone. As that idea developed, the iPad (an iPhone on steroids would be one way to describe it) was added to the mix, and I completed an update/survey about what I’d learned about both software and hardware, and that I needed to dig deeper (and post accordingly) on at least two apps, iBird and National Geographic. 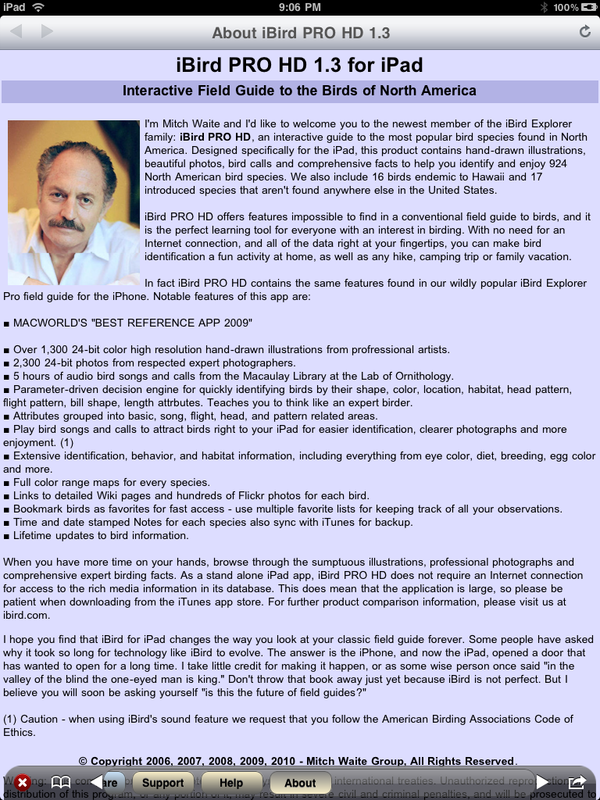 Following that post, we were contacted by the visionary founder of iBird, Mitch Waite, who offered to give us some background and guidance, especially on the new iBird Pro HD for iPad, which I had only recently purchased (we’re talking just a few days ago), and which was making a very strong and favorable impression on me. So, to start again…Birders looking for your excuse to buy an iPad? -- the wait is over! The stunning and complete iBird Pro HD for iPad is a fantastic app which takes advantage of modern technology with virtually everything one could imagine in a multimedia bird guide -- textual information, visuals (paintings, photos and maps), sounds (from the Cornell library no less), comparison charting, and access to the wide Internet world of resources from online encyclopedia, Birdipedia (or rather the page of that bird in Wikipedia), and the leading photo repository, Flickr. 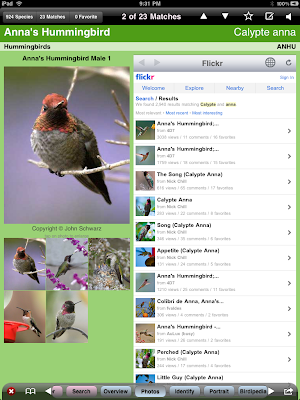 See the screen shot examples for the Anna's Hummingbird. 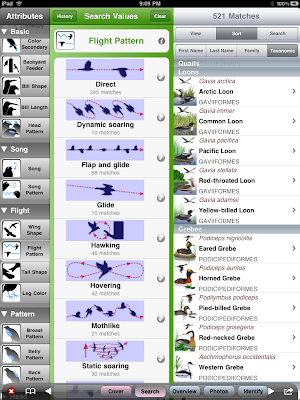 Keep in mind there are a number of birding-related apps for iPhone, and so far at least a few for iPad, and I recommend to readers that they try the free ones and read the reviews carefully for the apps before buying them. 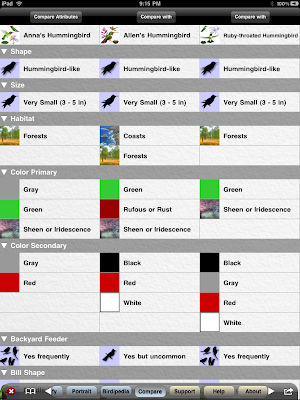 iBird offers a nice app comparison chart. As a conversation with Mitch Waite reveals, he recommends using the larger iPad for a home reference (I also picture it in the car on birding outings), and the iPhone/iPod Touch versions as your pocket-sized, field reference. Having accessible photos, descriptions, maps, and sounds in a single pants pocket or belt pouch is certainly has been new territory up until recently, compared to conventional field guides (books) and perhaps a second device like an iPod with BirdJam. 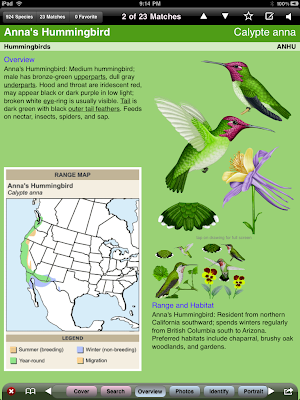 Searchability is another key ingredient for a birding app or standard paper field guide. 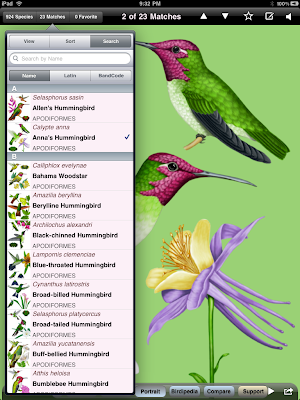 iBird makes bird look-up and identification as simple as possible. One can search by color, shape, family, and even flight pattern. For more on iBird Pro HD for iPad, a look at the screen shot to the left gives some details. But let me say, as a week-long owner of this $30 app (yes, expensive for a smartphone/iPad app but very reasonable compared to field guides and sound recordings, combined), I am delighted! 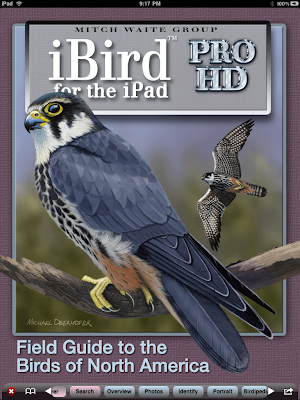 And how are others liking iBird Pro HD for iPad? As of this morning (September 15, 2010) iBird PRO has 10 “star” reviews in the Apple iTunes app store. The average is Five Stars, and in fact it’s a unanimous Five Stars, which is the highest score it can get! This is a very impressive, though of course it’s early, and an almost unprecedented rating that speaks to the excellence of this app. (Professionally, I cover a myriad of imaging and printing apps, and the large majority of them settle in at about a Three Star average.) A visit to the online store can give you a sampling of individual comments. 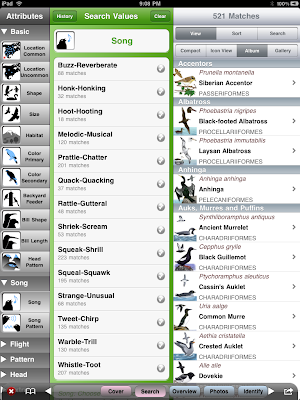 Above, I stated that iBird PRO includes virtually everything a birder could imagine in one app. However, there is one element missing, which is easily remedied. In fact, in my case, it was already taken care of, and that’s access to eBird, which is accomplished via the BirdsEye app. However, Mitch tells us to watch for a relationship between iBird and eBird in the near future. That last point brings to mind another advantage of going “electronic” – once purchased, apps are typically updated, free and often..a lifetime of updates. Try to get your traditional book publisher to do that! iBird Pro HD for iPad comes with only one caveat that I can think of, and that applies only with the supplemental materials. 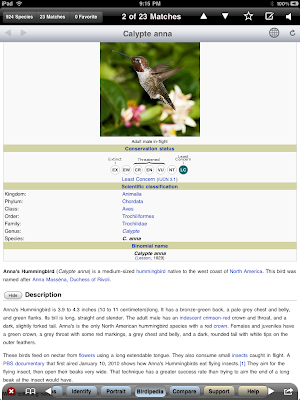 Because the online sources like Wikipedia and Flickr require an internet connection (as does access to eBird), only the 3G version of iPad will give accessibility to these in the field, i.e. beyond a WiFi signal. I have the (cheaper) WiFi-only iPad myself, so will count on my iPhone for access from beyond the pale (and even then, not sure of connectivity, 3G or otherwise, at places like Malheur). And not to get too techie, but those aforementioned internet resources are supplemental in nature, and the iBird Pro HD for iPad, at 1GB or more, is one of the largest apps out there (not a problem on basic 16GB and 32GB iPads), which is indicative of HOW MUCH bird-related material is included in the app itself, which is always available (and not connection-dependent). 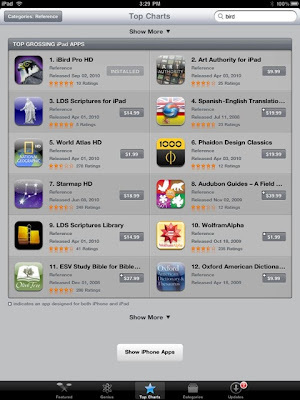 iBird Pro HD has been rated among the top apps since its release in early September. Because of the large size of the iBird apps (iBird Pro HD has more embedded photos than the Audobon app, which relies on photos only), iBird’s Mitch Waite points out that when you get your iPad, download your apps at the computer via iTunes and then synchronize with your new gadget, rather than the slower approach of downloading directly. And just so you notice, that last tip states “when you get your new iPad”, and not if! Editors note: Look forward to future Birding Technology reviews by Jim Lyons featuring in-the-field case studies using these apps! Jim, I think I need to tag-along on those adventures! Jim, you owe me $29.95. I read your review of this app and immediately bought it, thinking it must surely be simply awesome. But it's not. It's an embarrassing app. The screen display of the iPad has confirmed one of the great weaknesses of the iBird series... the second rate art. On the iPhone the image wasn't big enough to make it certain. Here it is unmistakable. The drawings aren't even as good as Audubon or Wilson, who painted centuries ago from stuffed specimens. Look at those images, they are flat and lifeless, and worst of all they are inaccurate. They don't begin to compare with the quality of art in modern field guides like Sibley and NatGeo, or even early editions of Peterson. I am in the mood for fall shorebirds, so I immediately looked at the White-rumped Sandpiper account. Mistake one: the bill is shaped incorrectly and most important, no note is made of a key field mark: yellow brown at the base of the lower mandible. The image shows it as pure black. For anyone trying to ID White-rummps, this would be a hugely misleading indicator. Same mistake is made for Pectoral Sandpipers. Also for the White-rumped, the white is shown to be on the upper half of the tail, not on the rump. That is wrong too. Also, the wing coverts are way to rusty for a real White-rump. The sound labeled call is actually the White-rump's flight song, and the sound labeled song is flight calls. No serious student of bird identification was asked to review these drawings. So I thought I'd see about some places I know. I checked out the Aleutian Islands. iBird Pro HD tells you there are 14 species there. Fourteen? It doesn't list any alcids or gulls?? What? No gulls or alcids on the Aleutians? AllAboutBirds tells you there are almost 200 species in the Aleutians. iBird Pro shows 12 Asiatics and two residents, and fails to show by far the most abundant species and groups. Under common species it lists Chinese Egret, Narcissus Flycatcher, Red-flanked Bluetail, etc. That's ridiculous. Same problems in Baffin Island and Ellesmere Island. Only 5 common species in Caribbean? Only 11 in North Atlantic Coast? What is this app smoking? I didn't look farther than this. Maybe totally coincidentally the first few things have errors and all the rest is correct. Statistically that's not very plausible. I did glance through a range of paintings and they are all amateurish, not up to modern standards. I think this app is a bad place for beginners to begin. It's best use is for experts, in a game of 'find the errors.' Lots of fodder there. @ArticBirder - I always appreciate feedback, positive or negative based on user experiences. 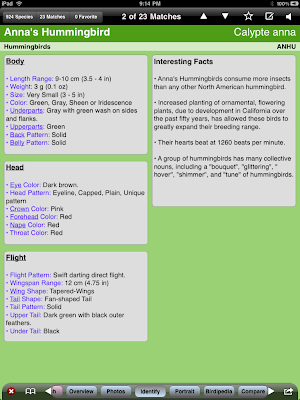 The art included on iBird is certainly more artsy than it is designed for identification help. What I like about iBird is the tie-in to flickr where you can see photos to help confirm i.d.'s. With regard to the the Aleutian Islands ...There are two location attributes: Location Common and Location Rare. Had you used Location Common you would have see it finds 189 species which is exactly the same as AllAboutBirds. Instead you likely used Location Rare which did its job by showing just the rare birds of those islands. I hope this helps make your iBird experience a little better! Artistic is one thing. Misleading and wrong is another. Beginning birders need accuracy. When I press "Location Common" it shows "Location Common" at the top of the 'search values' pane and it shows the Aleutians have 14 species. When I press "Location Uncommon" it shows "Location Uncommon" at the top of the search values pane and it shows the Aleutians have 189 species. Those results are just the opposite of what they should be. And the search function is really weird. Try going to Alaska. Choose a small size. Choose a primary color of buff. Stilt Sandpiper? Yet Stilt Sandpiper doesn't show up if you specify curved bill, nor does Dunlin. I don't think this app reflects the best knowledge of bird identification. Far from it. It is misleading. Clearly professional ornithologists and bird ID experts were not involved in its creation. The interface lends itself to misinterpretation. Gotta agree with ArcticBirder. The whole iBird series of apps is lacking in accuracy to the degree that it is actually counterproductive to use. For example, check the first photo of Lincoln's Sparrow. It's a shame the Sibley eGuide doesn't have the same marketing clout behind it.